Last week I was able to attend a session at the APA Conference that featured University of Minnesota Professor John Adams. I will refrain from fawning any more here than I did last week, but I want to share a provocative thought that I heard him explaining to someone else as I waited afterwards for his autograph (only kidding). You can see that some of the regional governments have a direct stake in the health of the local governments that are at the regional center. 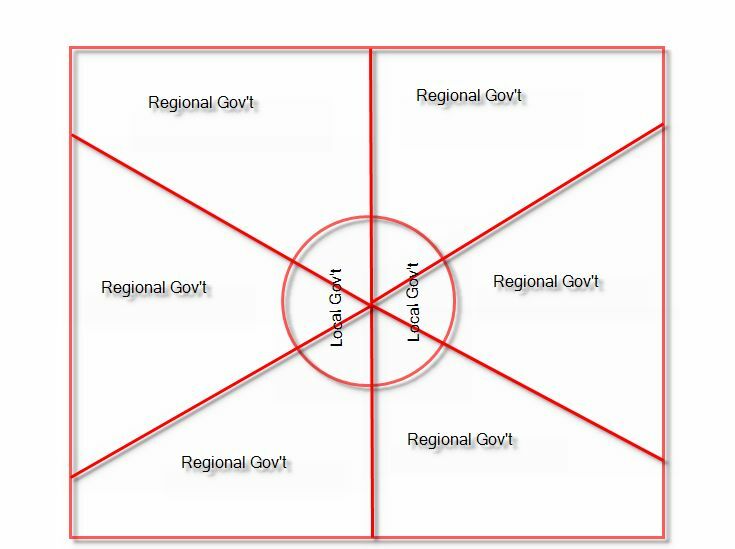 These regional governments would have an urban/suburban focus. The others would not have a direct stake in the urban core and would tend to be more suburban and rural. What kind of thinking does this alignment naturally create? 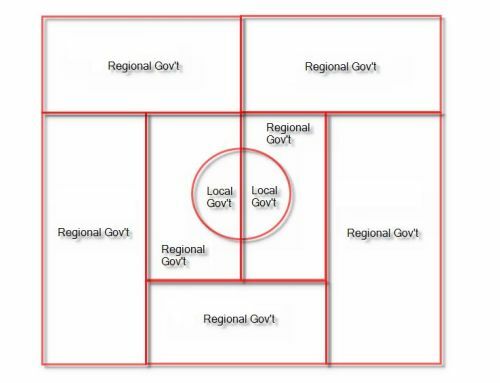 In terms of representation, this type of alignment would create a greater representation for rural areas than urban areas. Since representation equals distribution of resources, this would mean a disproportionate amount of resources (in terms of population, amount of commerce, etc...) would be spent in rural areas. This is essentially the subsidizing of small towns and rural areas that we see today. This alignment also creates tension between urban, suburban and rural areas. There is an incentive for suburban and rural areas to entice industry and heavy commercial operations to their regions, since they only gain (in the short term) from the transaction. Further subsidy, for example in the form of TIF, tax abatement or Minnesota's JOBZ program, tips the scales further and allows development that is neither efficient or financially solvent to go in suburban and rural areas. If we could redraw this map, here is another potential alignment. Notice how this really doesn't change the number of types of government, but it would dramatically change every government's thinking. While there would still be competition, such as attracting industry, everyone would have a stake in each geographically different type of area. The rewards for efficient land use patterns could be realized by the government responsible for them, while those governments that wasted their resources (for instance, on high-capacity roads that serve low traffic volumes), would be less successful. And each government would be in charge of managing their own rural/urban interface, the historically most difficult area to plan for and manage. I am not under any allusions that this realignment would be approved, and I don't believe Professor Adams would be either, but the exercise of thinking it through does help to reveal the powerful biases that exist in our system today. These are biases that predominantly favor rural areas, leading to inefficient development patterns and, in the long run, towns that are overly-dependent on state and federal government subsidy.